My family had milk cows for our own use when I was growing up. I preferred anything outdoors to doing anything in the house! However, I never got really efficient at milking the cows and didn't do it a lot when we got one here. None of our kids got any good at it either, so when they were leaving home for college, we sold the last milk cow. Still miss home made cream, but not the being tied down to being home all the time. We did always keep the calf so we could escape the job for a few days if we needed to. Sweet Basil, that retreat sounds wonderful! Such a pretty place and the luxury of being able to focus on whatever thoughts and reading or praying you chose surely was a blessing for you. So far as you finding a cow to milk, would a goat do? While I don't know anyone who has one of those, I read that it is getting more popular for 'back to the land' type families to have a milk goat. My family did that for a while, but I was very young. Think my brother was allergic to cows milk, but he apparently out-grew that problem. I do know goats can be a problem. Ours pushed me into a feed cabinet and wouldn't let me out when I was maybe age three. A frightening experience! Oddly, I can remember all that, but no being rescued, which I obviously was! I will try to call you when I know our schedule for being in SF. Probably be there the night of the 29, maybe the 30th, too. I guess everthing good requires work. It is indeed something I hope I will get to do before I kick the bucket. Who wouldn't appreciate being swatted in the face with a dirty tail? Faster horses wrote: I remember well the time I milked my first cow. Mr. FH was guiding hunters and hadn't returned. The milk cow was at the barn, bawling. I had tried to milk several times in the past. Just couldn't seem to get the hang of it. milk would flow out of her teats. I put her in the stanchion and gave her grain. Just normal stuff. Then I sat down to milk. Oh my. That cow had patience. But it took a lot more grain. She would change the weight on her feet. She would cough. She would turn her head around and look at me, seeming to say "what's taking you so long?" I finally finished. Took 45 minutes but I found out there was a lot of difference between "want to" and "have to" when it comes to milking a cow. I honestly think that if I put the bucket under her bag, she could have done it herself faster than I did. After that, I could milk her in 10 minutes, she was that easy. One of life's things that I will never forget. Thank you, for sharing your experience with milking a cow. I loved reading your post I would think cows have their own personalities. What happens if you don't milk a cow on-time? mrj wrote: My family had milk cows for our own use when I was growing up. I preferred anything outdoors to doing anything in the house! However, I never got really efficient at milking the cows and didn't do it a lot when we got one here. None of our kids got any good at it either, so when they were leaving home for college, we sold the last milk cow. Still miss home made cream, but not the being tied down to being home all the time. We did always keep the calf so we could escape the job for a few days if we needed to. Yes, milking a goat would certainly be a unique experience. Do you eat goat cheese? I don't like goat cheese, I have tried eating it but I can't develop a taste for it. It seems like my taste buds go into a panic attack just like when I have tried hot dogs. Last edited by sweetbasil on Sat Jun 18, 2016 4:10 pm, edited 2 times in total. May this post finds everyone having a good week. First and foremost, I want to apologize for my last post; I let my glass get to full with my work situation and let my flesh lead me. I could spit bullets that day, but if I am going to serve the Lord, I must learn to bite my tongue much more. I don't like getting angry and especially about things related to work. The events that led to me being so angry that day served me as reminders that there are things that are not for me to solve but God. Only God can use the circumstances to help me grow and for my good. It is not easy, but it is easier than being sold into slavery as Joseph experienced. I am just required to take each day and let God direct my steps. Work has been busy and lots of crisis have come up, not related to my functions, but being brought up to assist partners in helping with their functions that have an impact to the business I am overseeing. It appears that I will be assisting on a project to help transition to a new business in the west that is similar to the business here that I am involved in. My mom was here for two weeks and we got to do some fun things. We visited a little town in Illinois known for being a tourist destination. She sounded like a broken record and my mom's expression was priceless!! She looked at me in disbelief with a dose of fear! It was so difficult to contain myself from laughing. I kept pointing to her that we were not lost because I could see Roland's Iowa water tower from the distance. After a couple of U-turns in and within the corn maze, I surrendered and got the maps out! I though she was up for the adventure, but apparently a corn maze is not her thing. We didn't get home until around 2 AM that day, but 10 AM came around, and she was ready for the Stampede rodeo in Mitchell. Sometimes, the most memorable moments are those that you didn't planned for. I hope that she enjoyed her visit here. She did fall in love with SD even more. I couldn't sleep, so I though would write about a few adventures, but my computer crashed again, so I won't be able to write more today. 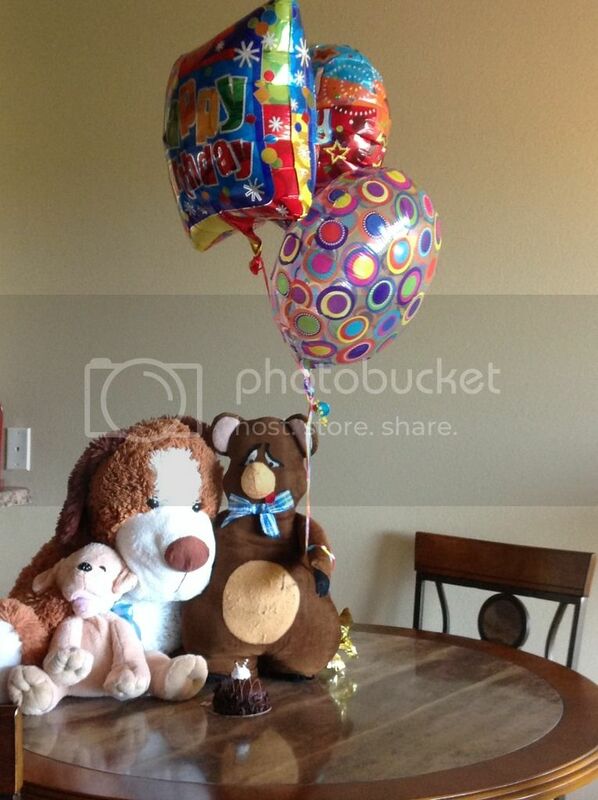 My mom managed to send me balloons and a little cake to "celebrate" my birthday today. The "Basil Squad" aka "Mr. Bear", "Big Red", and "Sparky" couldn't wait until today to get cake, so we had our celebration yesterday. Even though I don't have anyone to celebrare with, I am thankful that God loves me so much to have given me this many years of life. I have health, a place to live, and a job, and I won't be getting texts messages today telling me that "all you will get for your birthday will be divorce papers!" It is through God's love, grace, and your prayers that I made it this far. Last edited by sweetbasil on Wed Jul 27, 2016 12:02 am, edited 1 time in total. Guess wishes of Happy Birthday are in order. Busy haying here, Tammy and Britt took 4 days off and flew to Alaska for a wedding, should be back Saturday. Big Muddy rancher wrote: Guess wishes of Happy Birthday are in order. Yes, thank you. Today is that day of the year again. I have some neat things that have happened and will share soon. Happy Be-lated birthday, SB. I just now read your post. I hope you had a great day and here's wishing you a wonderful rest of the week. I pray more good things will come to you! Faster horses wrote: Happy Be-lated birthday, SB. I just now read your post. I hope you had a great day and here's wishing you a wonderful rest of the week. A very happy birthday, Miss Ella! It is sent from under the leading edge of lots of very angry looking clouds boiling around above our house. I knew it was a bit cloudy but have been ironing in the basement with a curtain over the window to keep the sun and heat out, so didn't see the progress of those clouds. A quick trip out to get my laundry off the line was in order! I came upstairs and threw a question over my shoulder to Shorty as I passed his office, and got no reply. Then remembered he was going out to the shop area to help grandson Bryer do something with some of the haying machinery being cleaned up for the season. Now, I believe they are putting vehicles and machinery into the shops, fearing we may get hail. Think there are a few big rain drops starting now. We surely could use some rain, but none of those ice cubes from the sky!!! Or as our grain farming friends say "that big white combine in the sky". I hope most of the wheat has been harvested because even a hard rain can be very damaging at this stage. Not sure how it treats sun flower seeds and other crops, but probably doesn't do it any good. Matthew has cows standing in our corral, and their calves in another pen beside the cows. They are being weaned. They are Longhorn cattle and he is going to use the calves for calf roping practice, so weaned them a little earlier than we normally do.